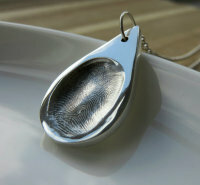 I make luxury Heirloom Quality, Foundry Cast Silver Fingerprint and Hand/Foot Print Jewellery. This is made using the ancient art of lost wax casting, a technique dating back to ancient Egypt. Each piece is struck with a British hallmark. A British hallmark shows that the silver has been independently tested for its purity by the UK Assay Office. Your jewellery will be individually hallmarked with three marks. The Laura’s Treasured Print’s makers mark, the Birmingham Assay office mark and a mark to show the purity of metal. Most keepsake jewellery is made from silver clay. Silver clay is made from fine particles of silver combined with an organic binder and water, which then kiln fired. Since I started making jewellery I have spent a lot of time looking at ways of achieving high quality silver jewellery. I found myself getting frustrated with silver clay as I wasn’t always 100 % happy with the finish and durability. I strive for the best quality for my customers so I started researching different techniques. I decided that the lost art of wax casting produced the best results. I carefully transfer your unique prints to the wax which is then hand carved and finished to your chosen design. Each piece is then precision cast at a renowned jewellery foundry in the heart of the country. Then your jewellery is lovingly finished and polished by myself. All my Foundry Cast jewellery is hallmarked and comes beautifully presented in a jewellery box, complete with a polishing cloth. My Inkless wipes work brilliantly to take hand- prints,footprints and paw prints. They are totally ink- free and leave absolutely no mess on your baby's, older child or adults hand or foot. All you need to do is to wipe the hand or foot with the wipe and then gently press them on to the special card I provide (you must use this card as it is coated with a special fixing solution.) The print will appear in beautiful detail.They are totally safe to use on even brand new babies as the wipes are completely non-toxic and regulated by EU safety laws. You can also use inkless wipes for your dog's or cat's paw print. When taking paw prints, I recommend that you cut some of the fur off around the pad of the paw if you dog or cat is very hairy. Please contact me and I can send you one of my inkless kits or you can send me a print using your own kit or ink pad and paper. After the print is taken I then reduce the size of the print to 'jewellery- size' using a special computer programme. I can then stamp your unique print on to your chosen piece of jewellery. There are two ways to take Fingerprints to produce a unique piece of silver jewellery (putty & ink print). They both give beautiful but very different results.The definition in fingerprints develop with age. Very young babies will not have a defined print. Therefore, if your child is under one year of age, hand or footprint jewellery is recommended. Jewellery from hand-prints or footprints can be taken at any age. Putty prints- These are taken with a two part silicone putty and give a result like a fingerprint being directly pressed into silver. If you choose the postal option I will send you some putty to press the finger into. Ink prints- These are taken with an ink sheet, (which I can send to you on request) or you can use your own ink pad and paper. All jewellery needs to be cared for to keep it looking its best. Tarnish is simply a reaction which naturally occurs when silver is exposed to moisture or reacts with hydrogen sulphide in the air. Tarnish appears as a dull, grey or black film or coating over the silver. Please remember your jewellery is an individually hand- made bespoke piece and these after care instructions will help prolong the beauty of your jewellery. Avoid your jewellery coming in contact perfume or aftershave, hairspray and body lotions etc. A humid environment may tarnish your silver. Please keep your jewellery as dry as possible and do not wear whilst showering, bathing or swimming (Chlorine can permanently damage and discolour your jewellery). Also please remove your jewellery when exercising and sleeping. You should always remove your jewellery before using any household cleaners especially those containing bleach as they may mark and ruin your jewellery. Soap can cause a film to form over your jewellery causing it to appear dull and dingy. Silver jewellery should be regularly cleaned with an anti-tarnish polishing cloth specially designed for silver jewellery. It is best to do this regularly to prevent any build up. One small cloth is provided with each piece of jewellery. I would recommend using this cloth to gently polish your silver after each wear. You should then wrap your jewellery in the cloth when you are not wearing it. The polish begins to wear off these cloths after opening. I would therefore suggest that you also buy additional polishing cloths to keep your jewellery looking good. Talk of the town polish clothes are a good option. Using a silver dip will remove the antique effect (the black effect on the print) but they work well for cleaning chains. I am always happy to advise you so please do not hesitate to contact me if you have any issues. If you are local to me I am happy to re polish your jewellery for you.